Occupational and Fraternal Shaving Mug, Including Four Organizations, this man clearly was well associated with various clubs and organizations in his community. 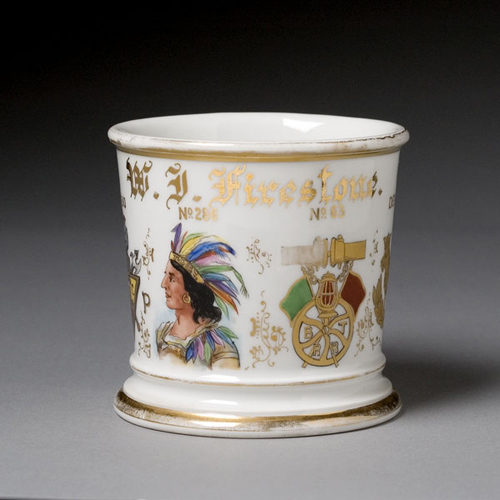 A porcelain mug with (from left to right) the Fraternal Order of the Knights of Pythias symbol, the Loyal Order of Red Men symbol with a lavishly colored Indian and headdress, the B.R.R. Trainmen symbol, and finally a gilt decorated Order of the Lions symbol. Above each is the appropriate lodge number. 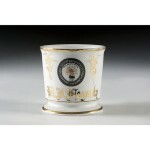 With gilt name W.J. Firestone. Marked T & V Limoges, France.